Different secondary sources, such as company websites, directories, and database have been used to identify and collect information that is useful for this extensive commercial study of the global advanced functional composites market. The primary sources, which include experts from related industries, have been interviewed to verify and collect critical information as well as to assess the future prospects of the market. The top-down approach has been implemented to validate the market size, in terms of value. With the data triangulation procedure and validation of data through primaries, the exact values of the overall parent market size and individual market sizes have been determined and confirmed in this study. Further breakdown of the global advanced functional composites market by major countries from Europe, including Spain, Belgium, Holland, and so on. Further breakdown of the global advanced functional composites market by major countries from Asia-Pacific, including Taiwan, Indonesia, South Korea, and so on. Further breakdown of the global advanced functional composites market by emerging economies of Middle-East & Africa and South America. 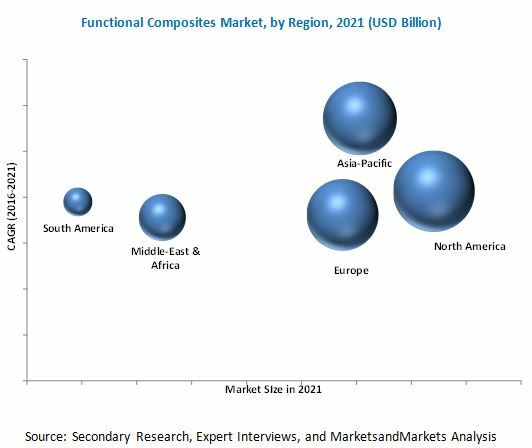 The functional composites market is expected to grow from USD 28.62 Billion in 2016 to USD 43.35 Billion by 2021, at a CAGR of 8.7% from 2016 to 2021. The market has witnessed considerable growth in recent years, due to applications of functional composites in various end-user industries. Functional composites are designed to perform various functions, such as thermal conductivity, electrical conductivity, barrier functions, and magnetic functions, among others, depending upon their composition. Based on matrix materials, functional composites can be segmented into metal, polymer, ceramics, and hybrid matrix composites. Polymer matrix composites are widely used in electronics and semiconductors industries, as they exhibit piezo-electric, magnetic, semiconducting, and conducting properties. Therefore, they are used in casings, structural parts, electronic papers, magnetic coils, and electrical boards. Functional composites are extensively used in thermal and electrical conduction. The thermally conductive segment of the functional composites market accounted for the largest share in 2015. Other functions of functional composites include magnetic, barrier, optic, and others. Functional composites are mainly used in end-user industries, such as aerospace & defense; consumer goods & electronics; transportation; building, construction, storage & piping; wind energy; and others. Based on end-user industry segment, aerospace & defense is the largest segment of the functional composites market, having accounted for largest share in 2015. This high share can be attributed to the increased usage of functional composites in key application areas, such as body parts of aircraft, combustion systems, and others. North America and Europe accounted for a major share of the global market, owing to the presence of developed aerospace & defense industry in these regions. Major manufacturers of functional composites are mainly based in these regions, with operations across the globe. Asia-Pacific is the fastest-growing market for functional composites market owing to the high demand from consumer goods & electronics and transportation industry in this region. The high cost of raw materials, especially with the addition of reinforcement, is the major threat to the growth of functional composites market. In most cases, carbon fibers are used as reinforcements. The price of carbon fiber is generally on the higher side of the cost and is thus, the major contributor to this high price. 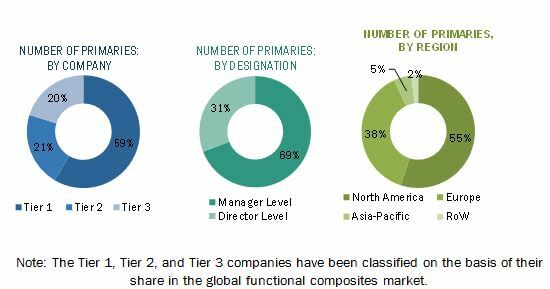 Key players operational in the functional composites market, such as Momentive Performance Material Inc. (U.S.), 3M Company (U.S.), Bayer AG (Germany), 3A Composites (Switzerland), and E. I. du Pont de Nemours and Company (U.S.), have adopted various growth strategies, such as expansions, new product launches, and agreements & collaborations. Several new entrants have also adopted mergers & acquisitions as a growth strategy to increase their market share. 12.10 Momentive Performance Materials Inc.